Transition from sitting to standing within seconds! Need a raise? Elevate your workspace with the Sorbus Sit-To-Stand Monitor Riser. 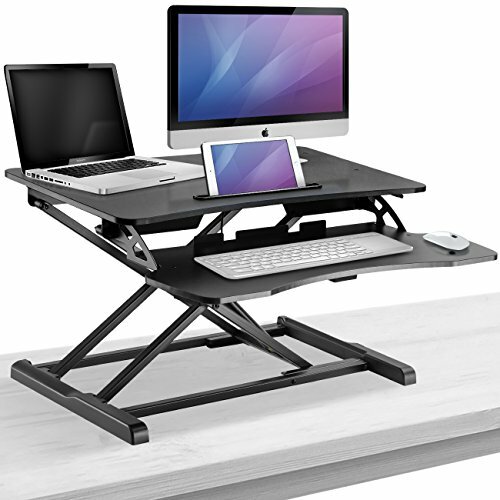 This workstation sits on top of your existing tabletop and adjusts into a standing desk within seconds! It features a spacious surface area for a standing dual monitor, laptop, tablet, notebook, and more with a keyboard/mouse tray for ergonomic comfort. Easy handle technology raises the monitor up to eye level to a stand-up desk converter and the external keyboard is positioned so your arms and wrists rest in a neutral position. For added convenience, the built-in tablet holder groove makes it easy to take notes, use an app, or stream meetings from your desktop. Designed with a modern and functional aesthetic, this rising desk is suitable for any workplace or home office. Take work productivity to new heights with long-lasting health benefits. Whether you're an Executive, IT professional, Graphic Designer, Medical Coder, Blogger, or run a stay-at-home business, the benefits of a sit-stand workstation are endless! If you find yourself on the computer for hours, never moving from your desk, or lacking movement, this adjustable desktop is ideal for you. Reduce prolonged sitting and improve overall health with daily sit-to-stand transitions, perfect for burning calories! After all, working 8-12 hour days make it hard to squeeze in a fitness routine. Reap the benefits of ergonomic comfort, boost productivity, improve posture, back /neck pain, and reduce the risk associated with heart problems with one simple solution! This durable sit stand desk is easy to transport and supports up to 50 pounds of equipment and supplies. Made of durable composite wood construction with a smooth matte finish. Ships fully assembled and ready to use! Adjusts to most users' height. Measures approximately 31.50 "L x 24" W x 20 "H.